We released Direct Mail version 5.2 today, and we’re excited to share with you some of the improvements that can be found in this new update. As always, this update is free for all users, and can be obtained via a simple software update. Direct Mail already integrates with over 700 popular apps and websites, allowing you to automate away the work of keeping your mailing lists up to date. In this latest update, we are introducing support for two-way contacting syncing via PieSync. PieSync allows you to keep your Direct Mail mailing lists in sync with any one of a number of supported apps and services (like Act!, Microsoft Dynamics 365, Quickbooks, Salesforce, and more). Direct Mail stays up-to-date in the background without you having to touch a thing, and special care is taken to handle unsubscribes, too. You’ll find this new feature in Direct Mail’s integrations directory. 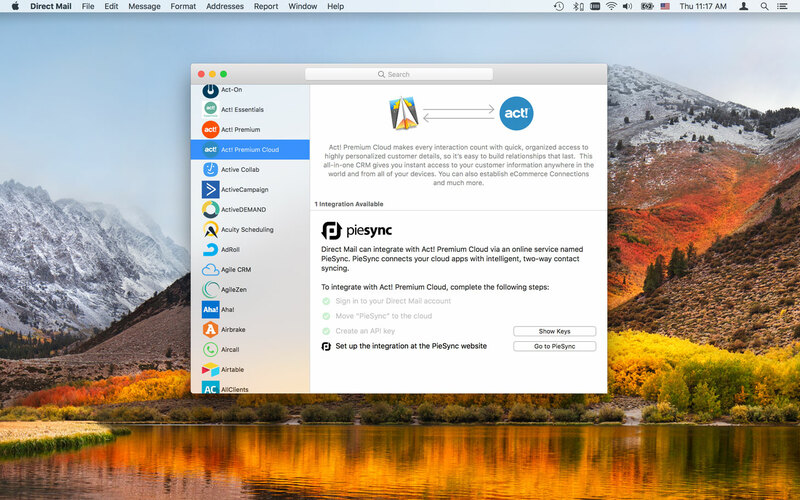 Just choose Window > Integrations from the menu bar at the top of your screen and search for the app you’d like to connect to Direct Mail. 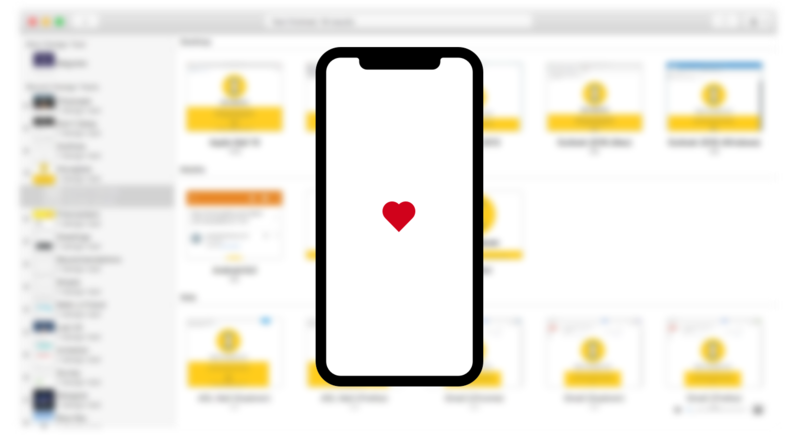 You can now see pixel-perfect screenshots of what your email will look like on an iPhone X and iPhone SE, as well as how it will appear in webmail clients from Libero and Orange.fr. The addition of these email clients brings the total number of design test email clients to 70 (everything from Outlook to Android, Gmail, Yahoo, and more). If you’re not familiar with our Design Test feature, it’s a great way to see, ahead of time, exactly what your subscribers will see when they open your email on their own devices or browsers. We’ve also recently revamped the pricing. Unlimited Plan customers now can run a number of design tests for free each month, and Pay Per Email Plan customers can run tests using their existing email credit balance. To check it out, choose Message > New Design Test from the menu bar at the top of your screen, or click the Design Test button in the toolbar. The custom fonts included with Direct Mail have been updated for improved legibility and compatibility. Of particular note is the Montserrat font, which now renders using a slightly heavier weight for easier reading (especially on mobile devices). If you haven’t already, we suggest taking a look at the new templates that shipped in version 5 to get an idea of how nice the new typography and layouts can be. Just click the “Choose Template” button in Direct Mail. Some additional improvements in this release include: more reliable uploading over spotty or slow network connections, improved keyboard navigation in the message editor, and several bug fixes. You can see a full list of everything that has changed in version 5.2 by choosing Help > What’s New in Direct Mail from the menu bar, or by clicking here. As always, thank you for your continued support, emails, feature requests, reviews, and all manner of feedback! We love to hear from our customers (and potential customers) about how Direct Mail is working for you, and how it could be even better. We hope you enjoy the improvements in Direct Mail 5.2 and we look forward to sharing more with you in the coming weeks.